Every country has their thing. The Brits have their tea and biscuits, the Brazilians have their football, the Thais have their temples and cheap Bangkok hotels and the Malaysians….the Malaysians have their food. An enticing mix of Chinese, Indonesian, Indian, native Malay and Thai, Malaysian cuisine is justly famous, and the Malaysians take their food culture seriously. The eclectic mix and broad range of food on offer can be a bit overwhelming for first-visitors, but at least two or three of the following should be on the top of every foodie’s “must-eat” list. Pronounced “roti chennai”, this is a breakfast classic that just as good for lunch, dinner or a midnight snack as it is first thing in the morning. A sweet, doughy, flaky pancake made from flour, egg and ghee (clarified butter), roti canai is paper thin, elastic and on just the right side of sweet. A Malay version of an Indian classic, roti canai is often served with mild curry or classic lentil dal, but can come with eggs (like a slightly sweet omelette), onion or fish. It’s practically compulsory to enjoy this with the sweetest teh tarik (pulled tea) you can find. There are many different laksas (spicy noodle soup) in Malaysia, but asam laksa continues to be one of the best. Tart and slightly sour, this tamarind-based broth has noodles, flaky white fish, cucumber, pineapple and a dash of the bitter torch ginger flower on top. An interesting blend of Malay and Chinese cuisine, the way asam laksa is made and served differs slightly throughout the Malaysian peninsular, with the spiciest versions found up north. The best Hokkien mee is found on the streets of Kuala Lumpur. Chinese-style fried yellow noodles braised in dark soy sauce and served up with squid, pork, fish-cake and cabbage, with small squares of calorific pork lard on the top. Sinful and delicious and an absolute must-try! You can’t have a post about Malaysian food without talking about Nasi Lemak, Malaysia’s national dish. 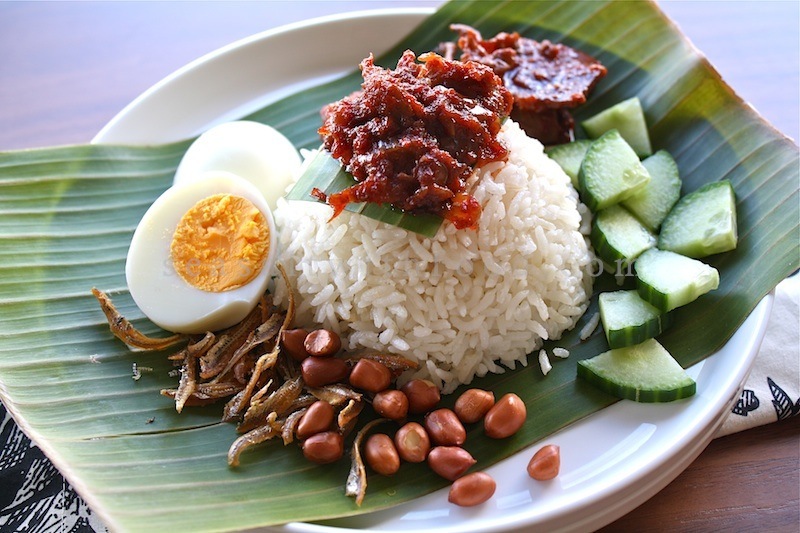 Literally meaning “rice in cream”, nasi lemak is a childhood favourite that can be eaten at any time of the day, but is particularly satisfying for breakfast. Rice is cooked and steamed in coconut milk and pandan leaves, then topped with sliced cucumbers, roasted nuts, dried anchovies, hard-boiled egg, and a generous helping of sambal – a spicy sauce made from chilli, spices and pepper. This deceptively simple dish is incredibly satisfying and can be eaten alone or alongside a chicken or beef rending (beef cooked in dried spices and vegetables). You can get satay anywhere these days, but the original and the best satay comes from Malaysia. Basically skewered meat served with peanut sauce, onions and cucumber, satay is simple and delicious. Satay meats are varied and can be anything from good old chicken to more exotic fish or rabbit. Some of the best satays can be found in the street stalls of Kuala Lumpur and Penang – just take a look and take your pick! Ok, it’s not a food, but teh tarik is so quintessentially Malaysian that it had to be included. Teh Tarik literally translates to “pulled tea”, and is drunk all over Malaysia at all times of day and night. Strongly brewed tea is sweetened with copious amounts of condensed milk, and prepared by pouring the tea from one jug to another before serving, giving it a thick and frothy consistency that is hard to resist. A word of warning though – the amount of sugar in one glass of teh tarik can be a bit overwhelming for the uninitiated, so you can try to ask for it less sweet…unless you’re looking for the ultimate all-day sugar high! ← Are You Suffering from Traveller FOMO?